Zenescope Entertainment has partnered with Director/Producer Jack Heller and his newly formed ASSEMBLE MEDIA, to bring some of the company’s most beloved titles to film, TV, and the ever-growing new media landscape. Last Saturday, Heller joined Zenescope founders Joe Brusha and Ralph Tedesco at Zenescope’s New York Comic Con panel where they gave the crowd a sneak peek at their first collaboration, a short film based on the company’s best selling comic book ROBYN HOOD. The short, directed by Jack Heller, stars Banshee’s Lili Simmons in the title role and will be available via the Zenescope website, Popboom.com, and across multiple social media platforms. In addition to working on a live action feature film of ROBYN HOOD, Brusha, Tedesco & Heller have begun development on another of ZENESCOPE’S best selling titles, the anthology Horror series, GRIMM TALES OF TERROR. Of Grimm Heller said “So many of us horror fans grew up on comic books and horror anthologies, with Grimm Tales of Terror, Ralph and Joe have crafted a dangerously fun and frightening recipe for horror. 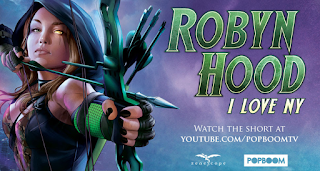 With so many tales to choose from, I look forward to finding the most horrific ways to entertain audiences.” Like ROBYN HOOD, they plan to develop TALES OF TERROR while simultaneously producing digital content around the project. Of the partnership Heller said, “The genre bending universe that Joe and Ralph have built is a perfect storm of creativity that makes the possibilities for Film, TV, and the ever expanding new media landscape astronomical.” "Jack's been great to collaborate with," said Tedesco, "He's directed & produced a lot of films over the last few years, but more importantly he's had success doing it. His work ethic and ability to get things done both inside and outside the box is impressive, but most importantly his creative vision is in tune with Joe's and mine." Heller is Producing Writer/Director S. Craig Zahler’s BRAWL IN CELL BLOCK 99 starring Vince Vaughn, which is currently shooting in NYC, and is also producing an upcoming remake of the cult horror classic Puppet Master. Zenescope Entertainment is currently in various stages of development on multiple film and TV projects based on their best selling comic book series, including Syfy channel’s newest show VAN HELSING.